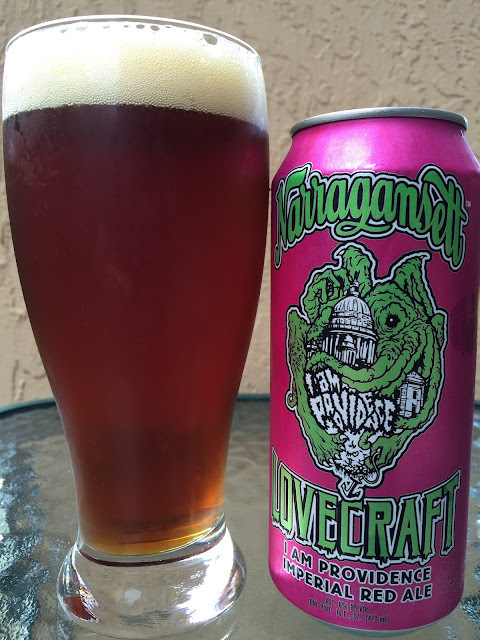 Today I'm checking out Narragansett's I Am Providence Imperial Red Ale: Lovecraft Series Chapter 3. This series is dedicated to H.P. 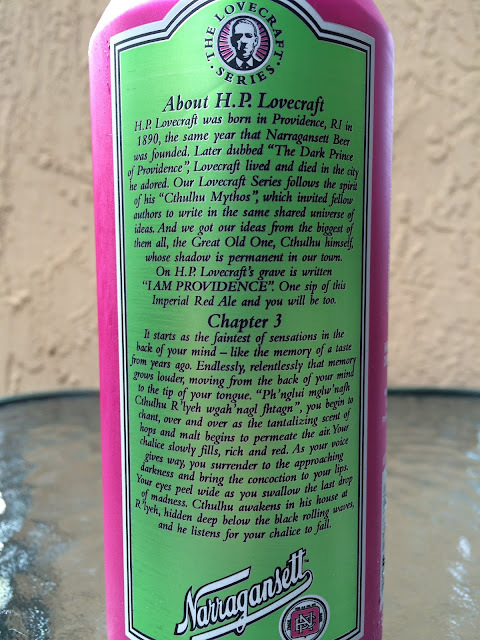 Lovecraft, with Chapter 3 touching on his hometown of Providence, Rhode Island. There are a lot of nonsense words on the pounder can, including "Cthulhu Mythos," some shared writer stuff, which you can see on the picture below for more. Go ahead and read the story of H.P. and what to expect from this Chapter 3 salute. The can depicts what I called an elephant monster hugging the Providence Capitol building. Then I found out that nice monster was really Dread Cthulhu waking to devour the Rhode Island Statehouse. Illustration by local artist GunSho aka James Quigley. 8% alcohol. Caramel aroma, straight up. Nice rich caramel flavors followed by an interesting toffee. Citrus orange, lightly zesty. Very spicy with a big hoppy bang. Candied hops, sweet but with a great hoppy, bitter, spicy answer. A little astringent and alcy at the finish but I can overlook that. I liked it.